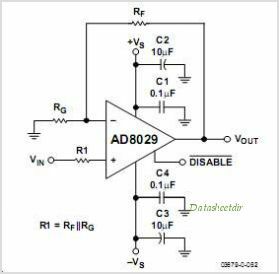 The AD8029 is a single, Rail-to-Rail input and output High Speed Amplifier with a quiescent current of only 1.3 mA per Amplifier Despite its low power consumption, the Amplifier provides excellent performance with 125MHz small signal bandwidth and 60 V/s slew rate. ADI's proprietary XFCB process enables high speed and high performance on low power. This Amplifier exhibits true single-supply operation with Rail-to-Rail input and output performance for supply voltages ranging from 2.7V to 12V. The input voltage range extends 200 mV beyond each rail without phase reversal. The dynamic range of the output extends to within 40 mV of each rail. The versatility of the AD8029 allows the user to operate the Amplifier on a wide range of supplies while consuming less than 6.5 mW of power. This feature extends the operation time in applications ranging from battery-powered systems with large bandwidth requirements to high speed systems where component density requires lower power dissipation. The AD8029 is the only low power, Rail-to-Rail input and output High Speed Amplifier available in SOT23 and SC70 micro packages. The Amplifier is rated over the extended industrial temperature range, -40C to +125C. This is one package pinout of AD8029,If you need more pinouts please download AD8029's pdf datasheet. This is one application circuit of AD8029,If you need more circuits,please download AD8029's pdf datasheet.